serve one another with whatever gift each of you has received. My morning’s meditation topic was “service” and it started a train of thought (ok it was actually a brain worm but let’s not quibble) about how I “serve” others. I must admit there are times when I am not very nice and I do it only because I have too or to prevent an argument. I am quite good at rolling the old eyeballs in those instances. But that is not what Jesus taught; the Gospel of Mark records Jesus saying “Whoever wants to be first must be last of all and servant of all.” (Mark 9:35b) In fact all through scripture we are called to be God’s servants and, from my perspective, if we are all, humanity and creation, images, the manifestation of God in the world then it makes perfect sense that we are also servants of all we encounter, human or otherwise. To be a true witness of the resurrection is to serve, with joy, our fellow travelers on this planet. That means caring for the earth and all that lives on it. It means caring for those who cannot care for themselves, speaking up for those who have no voice and doing all with grace and with every ounce of our God given gifts. One of my favorite rituals is foot or hand washing. To personally hold someone’s hand or foot in your hands, pouring the water over them, wrapping them in a towel and then look them in their eyes and tell them they are beloved by God gives me chills. But rituals aside service means anything that places you in the position of servant. Cleaning the home of an elderly friend or family member, mowing the lawn and weeding the garden when you know the owner can’t bend over anymore, creating a garden and sharing the harvest with neighbors or a shelter all are ways we may offer our service. But there are even simpler ones that often get overlooked; such as picking someone up for an event, calling on the ill, taking out the garbage or keeping a room clean. These are services that make life easier for others and, when done with joy, happiness in our own lives. So this week I am challenging you to 1) notice when you do a simple act of service, and 2) if the opportunity comes up to offer your special gifts to others to give it a try. When you do you are witnessing the resurrection in action and love blossoms. In 3 days I am going to enter the hospital for back surgery. This is an eagerly anticipated event because I have been in so much pain for such a long time and this is my best chance at relief. But it got me thinking about healing and the value of touching and holding those in pain. It is not uncommon to be afraid to touch or hold a person in pain, either physical or mental pain, because we don’t want to cause them any additional discomfort. But, when it comes right down to it those of us who suffer chronic pain want to be held. To feel the gentle touch of another person helps us to know we are cared for and loved, that we aren’t forgotten or discarded. 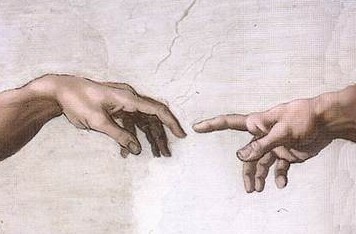 You see there is much power in the touch of the human hand. The hands of the surgeon will move across my back and do their best to heal the damaged spine. The hands of the nurses will offer comfort with a warm blanket, a cool cloth for my head, or simply to touch and let me know I am not alone. My husband’s hands will hold mine before and after surgery and they will convey his love without words even if I am unable to respond to him. The hands of the physical therapist will hold me and support me as I regain my strength. The silent touches, hugs, and holding all convey the message of I care for you, I love you, and you are not alone. My prayer practice for you this week is to be aware of those in need of your healing touch. Hold those you love in your arms, give a hug to someone struggling to make it through the day, or gently touch someone’s hand and let them know they aren’t alone. I also am going to ask for prayers the surgery on Friday, that it will be successful and that I will be relieved of chronic back pain. Thank you all, blessings and peace for the coming week.